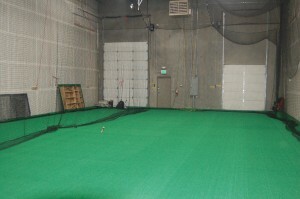 Big 3 Baseball Academy is an indoor baseball and softball practice facility located in Layton, UT. Our mission is to provide a year-round training facility for baseball and softball teams or groups of athletes located in Northern Utah. It is our goal to provide a safe, self-sufficient practice area for all age levels. Our unique business environment allows customers to self access the facility after 5pm, as well as weekends, 365 days a year. When you rent the facility at Big 3 Baseball, you have access to all of the hitting and pitching stations. The facility can be utilized using the three separate hitting and pitching lanes, or the lane dividers can be pulled back to create a more open “infield”. Contact us for individual rates, as well as our Team Membership rates. Big 3 Baseball Academy is waiting for you to experience practice in a controlled environment, and excited to watch what it does for the skill level of your team and players.